A Dozen Plus Ways to Eat More Greens: | Audio and video stories from Southwest Washington. Incorporating more greens into our daily lives creatively, tastefully, and simply is one of the best ways to receive and share forward the gift of health. As I shared last week, knowledge and understanding are of no significant value, however, unless practical application takes place in our daily lives. The wonderful news is that the options for eating more greens are truly endless! Here are over a dozen ideas and recipes on how to delve into eating the most nutrient-rich foods on our planet in delicious and practical ways. Sautéed greens can be added inside or to the side of any dish. In fact, they are so easily prepared that it is done incorrectly all the time. Overcooking greens is one of the biggest mistakes I see done by well-intentioned individuals aspiring to boost their intake. While all greens can be eaten raw, even the thickest greens require no more than 3-5 minutes maximum cooking time on medium heat. Cooking beyond the 3-5 minute marker substantially diminishes their delightful natural flavor and precious minerals such as potassium and magnesium. Set a timer—do not trust your sense of time! You will be surprised both by how fast 5 minutes flies by as well as the superior taste veggies are when cooked just to al dente. Keep seasonings minimal, as the natural flavors of greens are best appreciated with little to no doctoring. Stir sautéed greens in with beans, stir-fry, a wild rice dish, or into a scramble or omelet. Use my 5-minute sautéed kale recipe at the bottom of this post as a suggested template for cooking any variety of greens. 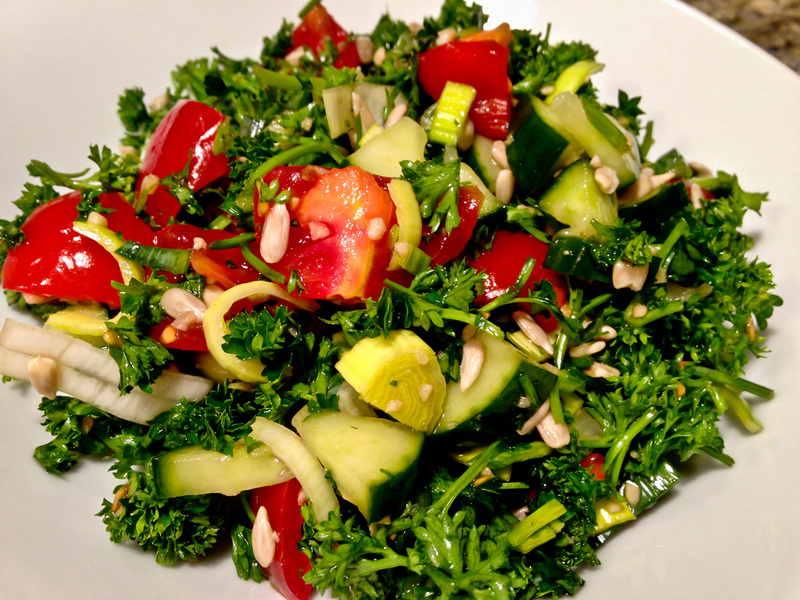 Greens can be made into a dip or spread, such as a pesto sauce or my savory kale spread. 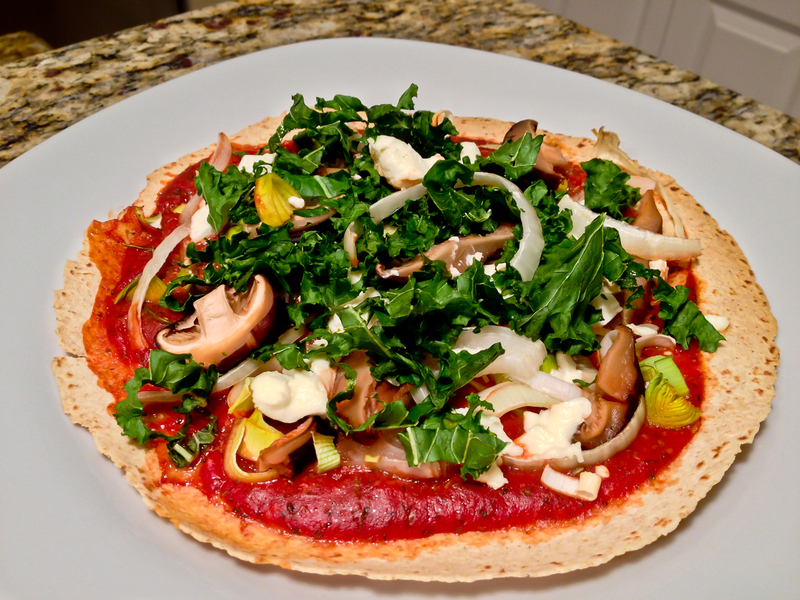 Enjoy with crackers, fresh chopped veggies, and spread onto toast or pasta. Wilting greens into sauces and soups is so easy! Five minutes before serving any warm dish such as soup or spaghetti sauce, add the greens and let them wilt into the hot dish. From bok choy in miso soup to kale chopped into my famous salmon chowder, greens will tenderize and add new dimensions to classic recipes. Kale chips are all the rage these days. Try them out! As well designed as our teeth are, is it easier to drink a much larger quantity of greens than it is to chew the same amount. My husband and I drink my perfect green smoothie every morning. Greens can even be snuck into sweeter treats. Non-dairy milk, spinach, dates, cocoa powder, and peanut butter can be blended into a guilt-free peanut butter chocolate shake that sneakily hides greens. Let the creativity flow! Salads, while a more typical approach to eating greens, offer thousands of combinations to keep recipes fresh. Lemon juice, minced garlic, and a pinch of sea salt is the easiest dressing to season all greens in just 2 minutes time. Peppery tasting greens, such as arugula, watercress, and mustard greens become surprisingly palatable when combined with sweet fruits like dried cranberries, chopped dates, or fresh sliced peaches. Collards are best included in salads by slicing them into thin ribbons. Kale is best massaged—literally—so that the fibers in the plants tenderize for easier chewing and absorbing seasonings. Be sure to try my number one hit recipe of all—my Zesty kale salad recipe—for a launch into greens that will have even those new to greens requesting a second helping. Raw or steamed, the large leaves of collard greens, swiss chard, and kale make a nutrient-rich wrap to hold any food items from a cabbage roll dish, a filet of wild salmon, or even a grass-fed buffalo burger. Chop or minced greens into sandwiches like tuna, egg salad, or salmon and layer them onto bread in place of boring romaine or iceberg leaves. If mixing together the patty meat of a quality grass-fed burger, add color and flavor with shredded vegetables like spinach, cilantro, or carrot. While green smoothies are my first choice over juicing, juicing greens is also a great way to drink your leafy greens. · Season to taste with reduced sodium tamari soy sauce/pinch of sea salt, fresh squeezed lemon, or sesame seeds. Method: Chop greens and de-stem (if desired). Add greens, garlic, and either water or broth. Sauté for no longer than 3-5 minutes max! Season to taste. 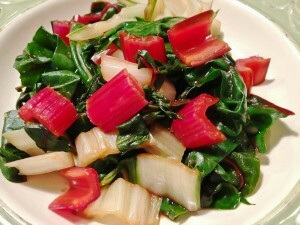 Creative Ideas: This same recipe serves as a template for any and all other greens, from swiss chard to collard greens. Just reduce the time for spinach, watercress, mustard/turnip greens, bok choy, and swiss chard to 3 minutes. Interesting Fact: The same nutrients found in the leaves are also found in the stems but simply in smaller quantities.